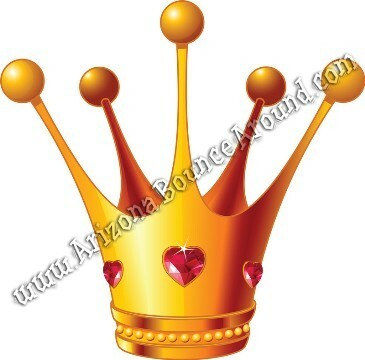 Princess Party Rentals in Phoenix, Scottsdale, Chandler, & Gilbert, Arizona. 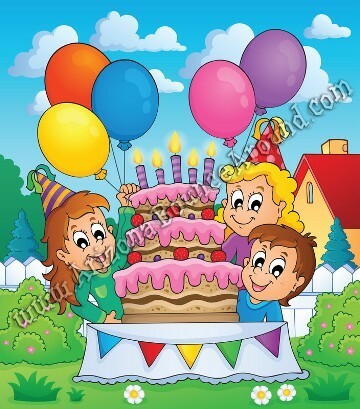 Kids birthday party ideas and princess castles for princess birthday parties in Scottsdale! This beautiful Princess Palace will be sure to please you and your guests. 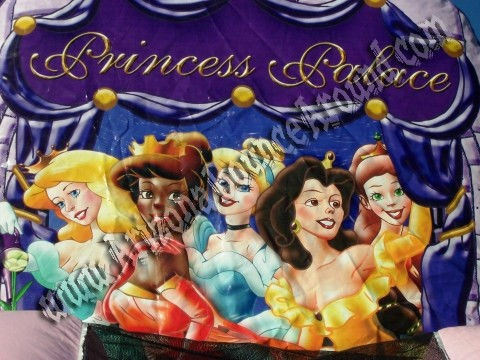 Every girl wants to be a princess and having this bounce house at your kids princess party will make it complete. This inflatable features a large full size bounce area with a 14' tall slide attached that kids love. 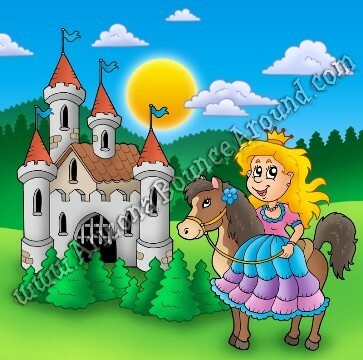 Rent this Princess Palace with slide for your next princess party. 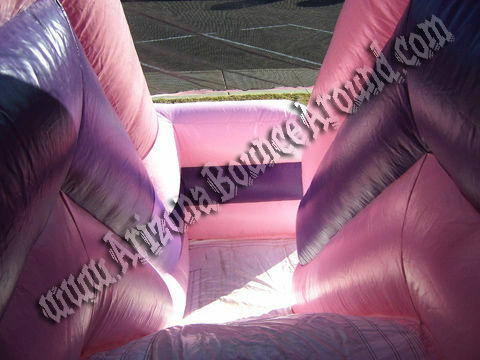 This beautiful Princess bounce combo will be sure to please you and your guests. Every girl wants to be a princess and having this bounce house at your kids princess party will make it complete. The steps are easy to climb even for 3 year olds and you can access the slide from right inside the bounce area. We do not rent this Princess Castle as a wet slide during the summer so you can assure that it will be clean when it's delivered. We rent lots of accessories for Princess parties like chairs and party decorations so spend some time looking at our website or call one of our party planners today for assistance. We do not rent this Princess Castle as a wet slide during the summer so you can rest assured it will be clean when it's delivered. 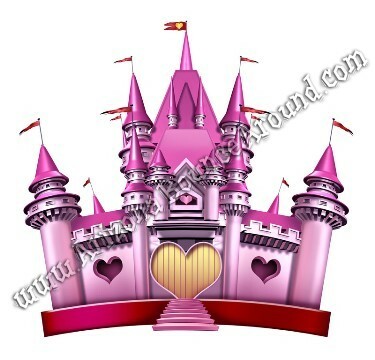 This Princess Palace is not affiliated with Disney but we rent the latest Disney Princess Combo available. 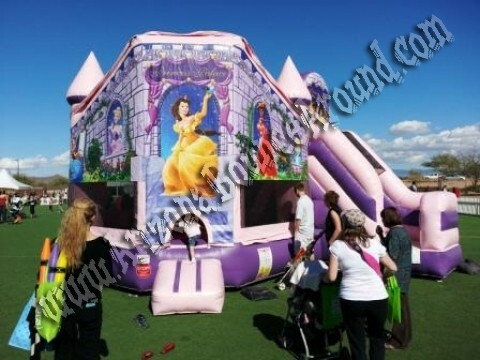 Customers who rent this Princess jumping castle often rent Pink Chairs, Pink cotton candy, Princess Yard Art and Inflatable Princess Thrones perfect for photos. We have lots of party rentals for kids birthday parties available and we deliver them right to your location for a hassle free princess party. Scroll down the page for more actual photos of this Princess Castle Combo along with a princess party package that includes everything you need. The Princess Palace price includes standard set up. Standard setup is considered a a real grass area or indoors within 80 feet of sufficient electrical supply. Delivery and removal within included delivery area with no restrictions for delivery, set up or pickup. Park parties require additional items and will increase the total rental price. The prices vary by city or requirements so please call for Proper Park pricing on this Princess combo.